real treat. Why do I love them so much? 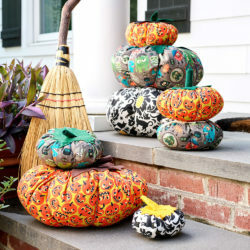 They’re super-easy to make, require few supplies and once you’ve finished making some, there are endless ways to use them. 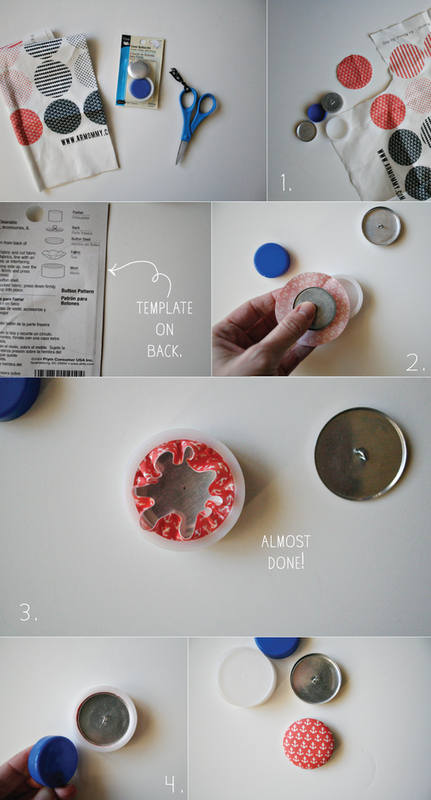 I’ll get into some project ideas in a bit, but first a button-covering tutorial…. pattern that came with your buttons! Get out your supplies. Using the button template, cut the fabric to the appropriate size. Using the pusher (ours is blue), push the button shell into the mold. Then tuck the raw fabric edges into the shell and place the button back over the top. Next, use the pusher again to secure the button back. Push hard! Finally, turn the mold over and pop your new button out! So cute and simple, right? And like I said, once the buttons are covered there are so many ways to use them. findings (found in the jewelry section of the craft store or on Etsy). ears, look for a clip-on earring back to glue on instead! earring findings to the back of each button and let dry. 3. Wear or gift with pride! pillow that needs some tufting, a pencil. and pull the ends of your thread taught so the front is tufted, then tie off! 5. Find a cute place for your newly tufted pillow! and hot glue them into an arrangement that pleases you. Let dry. 2. 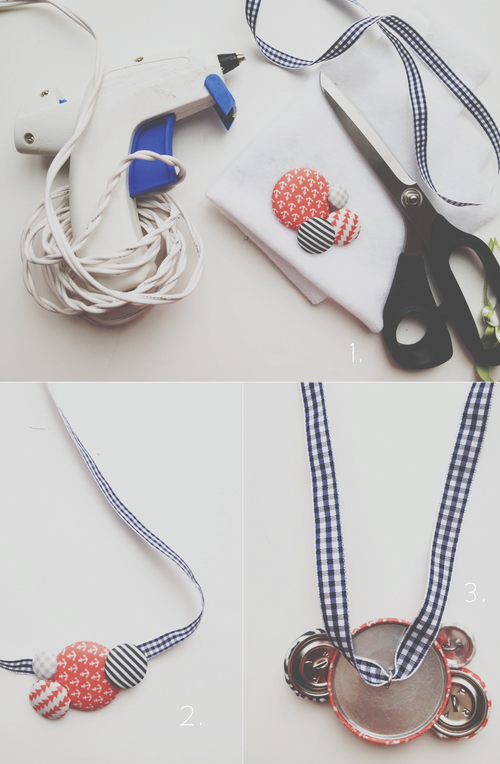 Thread the buttons onto a ribbon or shoelace. quarter, this is a great way to use them! one way to skin this cat. For those that are spatially challenged while sewing (like me), here’s a good method. through until they are all sewn together. 3. Carefully tear the lined paper strips from the backs of your circles and hang your new garland! Armommy where we’ve shared one other project idea. Awesome and fun projects and tutorials! I have been making buttons like this for years, and they are always so instantly gratifying with such little effort! I make book marks from mine with giant paper clips and buttons, and I also make rings,hair ties and headbands, amongst other things with the hand made fabric covered buttons! 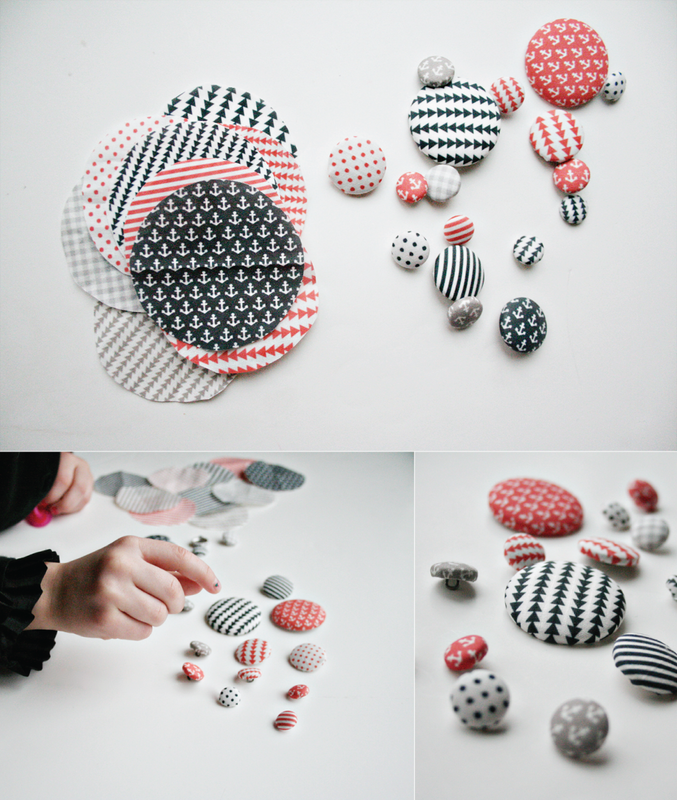 — Other fun things where buttons are the main focal point are always popping into my head, or hands! Love the garland! 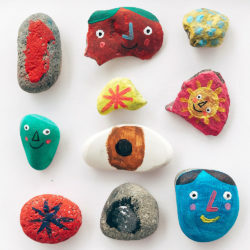 — What a fun idea, and creating them with other shapes would be exciting as decor for parties and such. 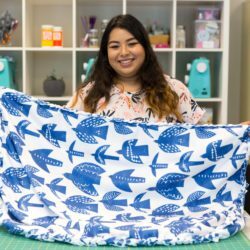 Thanks for a being a source of inspiration and fun, both spoonflower and bloggers such as Armommy! 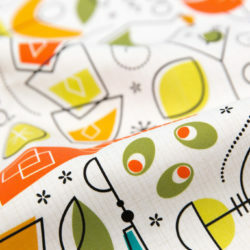 « Friday Photo: New Spoonflower T-shirts!